An original music / soundscape composition developed specifically for The Linen Memorial, Nov. 1 2002 and performed publicly in several Australian venues between 2002 and 2005. This work was conceived as a new media collaborative installation exploring the mediums of sound and sculpture. My intention was to investigate new intersections of sonic and visual elements in original ways in this new artistic frontier of time and space. This process has necessitated the invention and combination of sounds into unique combinations and contexts. These are detailed below. The discussion on the conception, artistic intentions and aspirations of the work in followed by a description of the structure and sectional substructures. The technical processes are discussed in relation to the nature of the expressive sonic materials, as well as to the spatial and kinetic aspects inherent in a surround sound environment. The new media aspects of the work are discussed and the various ways that individual elements are transformed by these events are examined. The initial conception, development and creation of this work aimed to integrate sonic and visual elements in a collaborative sound and sculptural installation. This was situated in an indoor art gallery environment in which textile visual art media were installed. 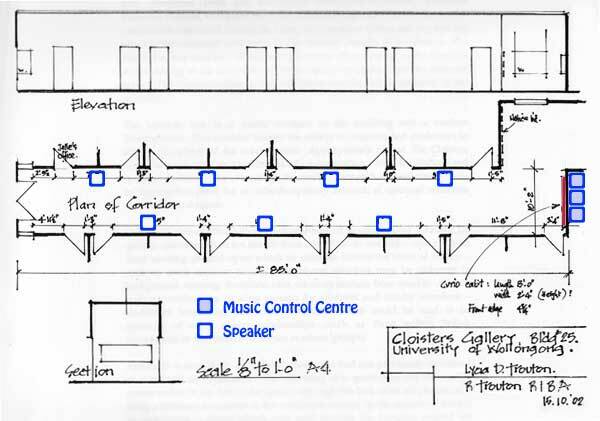 The acoustic properties and the physical dimensions of the [Cloisters] gallery space, and the textile works, guided the sound design and the location of the interactive and surround sound speaker systems. The intermedia work was conceived as an artistic response to themes of conflict, violence, intolerance and tragic loss and the empowering processes of forgiveness, healing, peace and transformation. Artist Lycia Trouton has chronicled the almost 4,000 killed in The Troubles on Irish linen handkerchiefs for this artwork. The exhibition Horrific Hankies: The (Irish) Linen Memorial was an art installation and counter-monument / memorial which aimed to express not only the darkness and sorrow, but also to empower and renew a passion for peace and the ending of violence. Sadly, world history illustrates the opposite trend in the last three years. After September 11th 2001 the escalation of violence has increased exponentially. In our haunted new millennium the threat of violence and terrorism is omnipresent…We are witnessing trauma and shocking disbelief on a new global scale. In this changed environment the Western World as a whole now shares with Northern Ireland, Isreal/Palestine, several African states and much of the Middle East the loss of trust, tolerance, and an entire way of life. In our changed cultural landscape, notions of ‘divine, sacred violence binds religious groups as a defining ritual, in some cultures replacing traditional sacraments as a way to paradise…new fanatical actions in wars motivated by complex forces…These issues have profoundly affected the creation of this work and widened the resonance to include an awareness that is not confined to Northern Ireland. The emotion of this complicated and multi-dimensional human tragedy is reflected in the choice of materials and processes used in the sonic work. Like the shoes in the exhibition about Jewish Holocaust victims by sculptor Christian Boltanski, each handkerchief is a poignant reference to a dead person, the tearful relatives left behind in their grief and the long tradition of the Irish linen industry and the sheer magnitude of the tragedy [on such a small island / in a country with a small population]. Elizabeth Cameron-Dalman choreographed a modern dance-theatre component in which three dancers perform an elaborate twenty-minute piece for the art installation. I refer to the composition score and audio CD of the Australian unveiling of Northern Irish – Canadian Lycia Trouton’s artwork on October 31st and November 1st 2002. I mixed this work to a 7.1 sonic surround format that gives some idea of the sonic momentum and spatial aspects of this work. The interactive elements have been simulated and mixed into this version as the most suitable was to present them. The electroacoustic work utilizes a diverse range of sound sources and techniques. Some of these sounds are non-pitched, some are semi-pitched and some are of defined pitch. The sound design was based on these sonic materials and how they could interact with the discipline of a surround sound format. Spatially composed sound has a multi-dimensional physicality that is missing from mono and stereo formats. In this format, sounds can be designed to inhabit a three-dimensional environment addressing continuums such as height, depth, and width of sonic dispersal amongst the loudspeaker diffusion. The resultant field of sound can be then modulated in a variety of ways. For example, the location, speed and type of sound can change places with each other in a kind of shifting counterpoint that is unique to this context of spatial multi-speaker sonic environments. The relationships between various sound spaces can be further manipulated in any number of ways. In this work, I have explored types of sonic movement as structural devices, each section of the work being developed as a kind of kinetic, textural entity, sometimes motionless and sometimes moving around the physical space. The creation of this level of detail in sonic movement patterns necessitates that new techniques be developed. Although sonic spatiality is a centuries-old tradition, the detailed nuances possible now in software and hardware is a relatively new area, requiring the development of an individual approach in my work. In a way, this is an innovative three-dimensional contrapuntal discipline that contrasts momentum, textural density and location of static sound as much as traditional pitch and rhythm contrapuntal techniques. Stretto, augmentation, diminution and canonic devices are translated in terms of speed and movement of sound from one, two, three or more locations. The shifting layers co-exist simultaneously in a variety of forms. Many elements are transformed in the process. For example, amplitude transposes into a variety of physical proximity phenomena; timbral details fuse and interweave as sounds travel through the sonic environment and as the sounds change places with one another homophonic textures become polyphonic. Choirs and Religious services in Belfast, Melbourne, Vancouver, B.C. Opening and closing of various doors. 2) The interactive components that intersect with this sound field. They develop new combinations of sounds each time the audience interfaces with them so that the musical work is always re-forming its own new variations. This section forms a separate work within the larger work. Entitled Inside Tears, this work is built on the collected sounds of falling water, including the sounds of external human body sounds such as teardrops and dripping blood. Sonic samples were also collected of falling blood and water from inside the human body. In addition, sonic fragments of the spoken voice readings of some of the names of the dead, church bells, and the loading of bullets are also mixed into this sonic tapestry. These sounds link the visual metaphor of the hundreds of white, Irish linen handkerchiefs that soften and comfort a recognition of profound grieving. In creating a secular requiem and memorial I have attempted to express a collective subconscious and conscious need for healing, comforting and transformation. The interactive system interfaces with the audience presence and movements in designated ways. Six infrared sensors were set up in the long corridor gallery space. Each sensor, custom-made by engineer Jim Sosnin of Quantum Plus, was given a specific area of the gallery environment to monitor temperature and movement changes. Essentially, these interfaces are motion-detecting sensors, triggering sound files that are controlled by the MAX / MSP software on a computer and projected out to the loudspeaker system. MAX / MSP is a real-time graphical programming environment for live and interactive computer music. It was created by Miller S. Puckette, a former research staff member at IRCAM in Paris, who is currently on staff at the University of California at San Diego, USA. The software enabled the interfaces to effectively trigger a range of audio sound files in real time as the audience members / viewers passed through the gallery space. Additional treatments involved the voices being sampled into Steinberg’s Halion software sampler for further pitch transpositions and amplitude modulations. The audio recording accurately simulates a version of this interactive contrapuntal activity. I refer the reader to the Appendix 1 for a graphic display print of the Max patch for this work. These sounds intersect and weave a sonic fabric with the larger 65 minute pre-recorded sound field, mixed in 7.1 format. The result is one where randowm real time contrapuntal activity contrasts with the fixed pre-determined playback sounds. These roles also partly represent the worlds of the interactive living (audience) and the non-interactive dead (the named victims of the Northern Ireland Troubles). The non-interactive sound component is constructed as a continuous looping work, 65 minutes in duration. It is in eight-minute sections, grouped into four movements. Further, this component has pitch, textural and spatial relationships to assist in the cohesiveness and balance of the work. These sections are detailed in the accompanying score and audio CD of the work. However, this broad outline describes the inherent creative processes and artistic intentions. I wanted to create a sense of timelessness and sensory shutdown in the beginning and ending of this work. I, therefore, selected the random modulations of white and pink noise frequencies of the frozen winds of the north and south polar ice caps. They sometimes fight each other and at other times blend so perfectly that a surreal harmonic resonance is clearly audible. The triggered vocal sounds are sounded against this icy windscape, forming an introduction of five minutes in duration. In this opening, the textures and spatial movements of the winds travel randomly, changing location momentum slowly at first, then quickly and finally slower again. They form a loose, three-part structure underpinned with dynamic changes, from soft to loud, with sudden sforzando bursts of sound within each section. Each of the eight sections has a specific physical and temporal arrangement of sounds. Additionally, the movement design for each section is shaped for the various textures of these individual sections. My artistic intention was to express the devastation, the numbness of shock, the inability to make any sense of the absolute horrific fear and terror that inhabits the insanity of trauma and violence, in particular long-term [The Troubles has been almost 40 years] violence. The polar wind sounds represent those irreconcilable representations of the human conflict, deep within the Irish psyche, the sounds of nothingness, a frozen and shocking numbing of the senses and the need to find some kind of voice, expression, even -- perhaps -- a way to end the tragic cycle of violence. In order to express a dimension of healing, from trauma to transformation, audio samples were collected and recorded from several First Nations Peoples (Canada) and European folkloric traditions, as well as from more industrialized cultures. Some of this source material was collected and recorded by Artist Lycia Danielle Trouton in the USA and Canada in October 2002. Her colleague, an Irish-American Catholic from Baltimore, who became a practicing Korean Buddhist nun, Chong Do Sunim (Sunim means Honorable) collected Asian chants and instrumentation. These were combined together with the other collected and sampled materials into a unified expression of many languages, melodic, harmonic and rhythmic variations and cultural influences. Gaelic songs performed by Lycia Trouton’s Whiterock, B.C. colleague, Kevin McFadden, amateur performer, storyteller, Gaelic language teacher. I have also included various spoken word and poetry recitations of works by English poet Wilfred Owen and the Irish poets Seamus Heaney and William Yeats. These voices were included to express some of the traditional and contemporary attitudes around the violence in both a direct and literal sense of the language and meaning of the words and also, indirectly, when the words are employed as pure sonic fragments. The overall design considers the interactive effect of an audience moving through a spatial sound environment. The non-interactive component of this sound work is structured in four main parts as linked and continuous movements, over 65 minutes and then looped for continuous play, for the duration of the installation of the artwork – memorial / counter-monument in the gallery space. This non-linear, infinite form represents the circular continuity of the life cycle, in contrast to linear time concepts - the conceptual relentlessness of time passing, acknowledging that this concept of linear time from culture to culture. Against this formal and pre-recorded structure, the interactive sound elements intersect in random contrapuntal ways, depending upon the number of people and their types of movement in the installation space. These sounds come from a wide variety of sources, as discussed, including excerpts of spoken voices and reading some of the names and various vocal and non-verbal sounds and cries, sampled sound bites from linen laundries, the tearing of linen cloth bandages and the flapping of wings. The sonic material was then further treated with various types of filters, reverberation and delay lines. In addition, they were developed with techniques of augmentation, diminution, retrograde, inversions, truncated and layers with each other and combined with each other for a random pattern of multi-channel playback across the various spatial locations. The sounds intersect with the pre-recorded soundtrack in indeterminate ways throughout the installation time; they stop only when there is no activity in the gallery space. This process underlines the randomness of the deaths, most victims were innocent people in the wrong place at the wrong time. Many of the interactive sounds appear and disappear in a similar fashion, out of sync, time and tune with the pre-recorded tracks. This characteristic is very effective in the opening and closing and transition sections where floating names and sonic fragments form an eerie contrapuntal texture against the sustained samples, modulating in various spatiality patterns. The four movements each have different functions reflecting the various themes inherent in each part. While this is not program music in a descriptive sense, the themes addressed in each do affect the way that the music has been designed. For example, the third movements focuses on the loss of innocence of children. The sounds and use of time, momentum and rhythm are very different to the second movement when the themes of violent conflict are expressed by associated sonic and rhythmic treatments. The movements are structured into a number of sections, each having linking relationships within. Due to the spatial nature of this work, as well as the very texturally rich semi-pitched and non-pitched harmonic sections, I decided to use specific intervals in contrapuntal progressions; there are a number of melodic and intervalic relationships between various sections. The work concentrates on shifting modalities and pentatonic resources to evoke the traditional Catholic associations. These melodic and harmonic progressions are also detuned and altered, to become ambiguous for greater expressive effect [across communities]. The piece begins and concludes with the unpitched white and pink noise modulations of the sampled polar winds, sounds that contain all frequencies of the audible pitch spectrum of sound. The intervals of the minor third, major second and tritone, feature throughout the work linking the various melodic and contrapuntal developments of the individual sections. The horizontal and vertical pitch relationships are structured inside formal and informal tonal and atonal zones. In addition, various modal key centres are explored as the Dorian, Aeolian, and Lydian modes. There is a relentless instability in the way that these key centres are used in this work, and even more so in the semi and atonal areas, for example in the opening of the fourth movement. Here, indeterminate elements interpolate with the G Dorian mode melodic fragments played on a Conch shell. The sounds of bullets traveling in a three-dimensional 7.1 surround sound mix, white noise winds, bomb blasts, the loading of ammunition, combine to form shifting and restless textural elements. They contrast with the shifting time signatures and atonal melodic sequences of the rapid flute phrases. This work employs a variety of contrapuntal techniques, including canonic free imitative counterpoint, as well as augmentation diminution devices. The form of the work is defined further by the spatial sonic movement patterns which are defined for each section in the score. Sometimes the subsections utilize a more traditional approach to the application of little sub-forms of binary, ternary and variations form, with conscious awareness of the balance of energies; there is also a strong sense of momentum and repose in the construction of the form of the piece. Time, rhythm and momentum have been utilized in a number of contrasting ways, often combined in non-measured and measured contexts. A great deal of rhythmic variety has been created with the random interactive sounds intersecting with the pre-recorded sounds. Each movement employs the type of rhythmic texture and change of rhythmic type to create a distinct and individual expression. Sometimes the rhythmic textures change very gradually as in the opening sections of the first movement. At other times, the rate of the rhythmic change varies from static to rapid rates of change, for example in the flute and harp sequences in the third movement and at the beginning of the fourth movement. The spatial movement of sound throughout the installation space reinforces the changes in rhythmic textures; this is technique that I have experimented with in this work. As the sound moves physically around the three dimensional space, in various directional combinations, another factor, the use of dynamic change, becomes very important. In my previous multi-channel surround sound works I had explored the location of sound sources as an expressive and structural component. However, these works were limited in the ways that fine graduations and nuances of change could be applied to the surround sound mix. Recent developments in both computer and hardware and software technologies have empowered these areas and allow for greater depth of dynamic graduation and sonic movement. As the sounds move through space the dynamic treatments have a significant impact on the perception of the sound in a way that is different to sounds that project from a fixed and static sound source. The use of depth of sound assumes additional roles as the various sonic elements are balanced and mixed together. For this reason I used a variety of reverberation sound treatments to bring sounds in and out of aural focus. These reverberation treatments included digidesign digital software plug-ins, as well as contrasting analog reverberation hardware, such as the lexicon pcm series. The digidesign spatilizer software plug-in was used to program the spatial movements from speaker to speaker, as designated in the score of the work (see folio score). This software allowed for a very flexible approach to the ways that work to be strengthened by these spatial movements of sound as an additional contrapuntal voice. I had not really considered the sonic movement as an active and dynamic contrapuntal device prior to this work, so it became an obvious new area to develop in other works and in other mix and speaker design formats. New software has enabled my work to explore contrapuntal sonic movements in this work, and develop new musical environments. The recent technology that informs the present frontier of spatiality, as discussed earlier in this thesis provides the flexibility and depth of nuance that extends this tradition further. The combination of these new techniques and older traditional material has appeared in recent recordings and live performance concerts of solo soprano saxophone improvisations of saxophonist Jan Garbarek and an a cappella male voice quartet, The Hillard Ensemble. This inspired combination of traditions and live performances employ subtle sound amplification and additional reverberation signal treatments. Although spatial modulation is limited to an almost static surround sound mix format, the extension of the sound world is considerable. The extension and synthesis of traditional materials (such as modal key centres and the incorporation of the formal Latin mass requiem texts) are also empowered by the spatial aspects of the surround sound environments. They create a very physical and focused context for experiencing the music. The linking of disparate elements is evident in the opening and closing sections of the work; the wind and interactive vocal elements gradually forming an awareness of pitched sounds and shifting key centres. The work begins with a low C natural, three octaves below middle C, in the Aeolian mode. The work concludes in the key area of A Dorian minor, or an unresolved, sustained E natural, fading into the unpitched wind and voice sonic textures. The tenor soloist has implored for peace, intoning ‘donna nobis pacem’ seven times on the same octave ascending motif, to a high A natural, his voice being moved around the speakers in a gradually decelerating and fading momentum. These incantations are modulated into the recapitulation of the opening polar wind textures that close the work as well as link it in a seamless loop connection to the beginning of the piece. This work continuously during the installation time. Any public comments of Dr. Thomas Fitzgerald in relation to this collaborative effort are his own opinion. The Linen Memorial officially endorses the following charity: The Belfast Youth Orchestra, in memory of Stephen Parker, teenager killed (wrong place, wrong time) 1972. Please contact 'CBYO' about your donation.